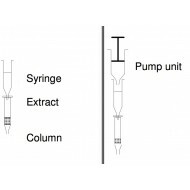 Aflatoxin (total) Immunoaffinity Column 10 columns per kit The Aflatoxin (total) Immunoaffinity Column (IAC) is a helpful tool in specific isolation and enrichment of aflatoxins from different matrices. After the IAC procedure the eluate can be quantitatively analyzed by various analytical tec..
Aflatoxin B1 ELISA Kit 96 well ELISA microplate Incubation time: 20 min Range: 1.5 to 24 ppb Sensitivity: 0.5 ppb Sample size: 100 µl Sample type: Cereals, beer, gyle Substrate: TMB 450nm ..
Aflatoxin B1 Immunoaffinity Column 10 columns per kit The Aflatoxin B1 Immunoaffinity Column (IAC) is a helpful tool in specific isolation and enrichment of aflatoxin B1 from different matrices. After the IAC procedure the eluate can be quantitatively analyzed by various analytical techniques ..
Aflatoxin M1 ELISA Kit 96 well ELISA microplate Incubation time: 2 h 20 min Range: 10 - 1000 pg/mL Sensitivity: <10 pg/mL Sample size: 100 µl Sample type: Milk, milk products Substrate: TMB 450nm ..
Aflatoxin Total ELISA Kit 96 well ELISA microplate Incubation time: 45 min Range: 0.05 - 1.5 ng/mL Sensitivity: 0.015 ng/mL Sample size: 100 µl Sample type: Food Substrate: TMB 450nm ..
AFP ELISA Kit 96 well ELISA microplate Incubation time: 40 min Range: 10 - 160 IU/ml Sensitivity: 1 IU/ml Sample size: 25 µl Sample type: serum Substrate: TMB 450nm ..
Aldosterone ELISA Kit 96 well ELISA microplate Incubation time: 1 h 20 min Range: 15 - 1000 pg/ml Sensitivity: 10 pg/ml Sample size: 50 µl Sample type: Serum, plasma, urine Substrate: TMB 450nm Further information Aldosterone produced in the adrenal cortex, is the most pot..
Almond ELISA Kit 96 well ELISA microplate Incubation time: 60 min Range: 0.4 - 10 ppm Sensitivity: 0.2 ppm Sample size: 100 µl Sample type: Food Substrate: TMB 450nm ..
Alpha Fodrin Antibody IgG/IgA ELISA Kit 96 well ELISA microplate Incubation time: 1h 5 min Range: 6.3 - 100 U/ml Sensitivity: 1 U/ml Sample size: 10 µl Sample type: Serum, plasma Substrate: TMB 450nm ..
AMA-M2 Antibody ELISA Kit 96 well ELISA microplate Incubation time: 1h 5 min Range: 12.5 - 200 U/ml Sensitivity: 1 U/ml Sample size: 10 µl Sample type: Serum, plasma Substrate: TMB 450nm ..
AMH Gen II ELISA Kit 96 well ELISA microplate Incubation time: 1h 30min RT/shaker Range: 0.16 - 22.5 ng/ml Sensitivity: 0.08 ng/ml Sample size: 20 µl Sample type: Serum, plasma Substrate: TMB 450nm Technical background The Anti-Mullerian Hormone (AMH) Gen II enzyme linke..
ANA Hep Screen ELISA Kit 96 well ELISA microplate Incubation time: 1h 5 min Range: Cut-off Sensitivity: relative 92.6% Sample size: 10 µl Sample type: Serum, plasma Substrate: TMB 450nm ..
ANA Profile ELISA Kits 96 well ELISA microplate Incubation time: 1h 5 min Range: Cut-off Sensitivity: N/A Sample size: 10 µl Sample type: Serum, plasma Substrate: TMB 450nm ..
ANA Screen ELISA Kit 96 well ELISA microplate Incubation time: 1h 5 min Range: Cut-off Sensitivity: N/A Sample size: 10 µl Sample type: Serum, plasma Substrate: TMB 450nm ..
ANCA Profile ELISA Kit 96 well ELISA microplate Incubation time: 1h 5 min Range: Cut-off Sensitivity: N/A Sample size: 10 µl Sample type: Serum, plasma Substrate: TMB 450nm ..